Ginkgo tea is a leftover from ancient times. It comes from a plant that represents the best of what Nature has to offer. This tree is, in fact, more than 300 million years old and has managed to survive until today. It has the status of protected species and originates from China where they you can find examples of the ones that are over two millennia old. What everyone is particularly interested in is why the drink is so prized in Eastern culture and traditional medicine. It is considered as one of the best natural aphrodisiacs. Although many try to deny the fact that it is healthy. All this is only part of what makes this natural remedy known and famous. Below we will get to know it a little better, so stay tuned and find out about what is ginkgo tea? What are its health benefits, how to make it and where you can purchase products on its basis. As we said, this plant is one of the few that has managed to survive such a long time. What is characteristic of ginkgo tree is what their origin leads back to the Mesozoic period. It is a deciduous species very resistant to wind, and greatly deals with snow and low temperatures. This is probably the main reason it has managed to survive so long. Its leaves are fan-shaped and is unique in this attribute. When it comes to growth, ginkgo tree can reach an average height, as much as 25 m. In China and Japan it enjoys the status of sacred trees and in these nations it is usually grown courtyards of houses and temples. What justifies this attitude is that all the pieces of wood can be used in the treatment of various diseases. The leaves, seeds, fruits, and even bark can be very useful for health. That is why ginkgo tea has been cooked for centuries, which is becoming increasingly popular these days. All parts of this plant contain over 40 different useful substances, but only two are most commonly used. These are flavonoids and terpenoids, and they are used for treatment. It is known that the former has a positive impact on the whole body, eliminates toxins and mitigates effects of free radicals. Furthermore, ginkgo tea is useful for the protection of the cardiovascular system, muscle and nerves. On the other hand, terpenoids are much needed for blood vessels, because they allow good blood flow throughout the body. Why should you drink ginkgo tea? 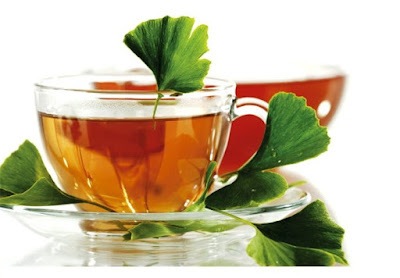 First of all, it is useful to drink ginkgo tea for circulation, especially if you have problems with it. It is recommended to drink two cups a day, in the morning and evening on an empty stomach in order to achieve the best effects. This drink will help with tingling in the arms and legs, and also will solve the problem with blood coagulation. In some people, the aging process can occur during certain brain and nerve cells in it. Although it is often said that this is a normal phenomenon with which we have to make peace, it cannot be the case. If you want to avoid Alzheimer's, do the right thing for yourself and drink this beverage. How useful is ginkgo tea for the heart is the fact that it contains terpenoids. They are very important for the health of this vital organ. Namely, it will positively affect the blood supply to the arteries and veins, thereby eliminating any possible blockages. Additionally, preventing their re-emergence, and you will reduce the risk of heart attack and stroke. When it comes to ginkgo tea preparation is extremely simple and fast. Pick five fresh leaves from this tree, or 2 teaspoons of ones dried if you cannot find this plant. Add them to the bowl and just cover with 2 dl of boiling water and let it stand for about 10 minutes. Ginkgo tea is necessary to strain and you can sweeten with local honey. What is particularly interesting is that it can always be combined with other medicinal plants. Its taste is very pleasant and will bring you much needed refreshment and a dose of medicinal substances and minerals. There is also evidence of how ginkgo tea is great for potency. In fact, according to many, there is no better natural drink for this purpose. Since it improves the health of blood vessels, it therefore has a positive effect on the reproductive organs, accelerating the circulation. Therefore, it is a natural cure for impotence in a growing number of men and women. Women also like to drink it, thus preserving their sexual power. Ginkgo tea is the perfect solution if you are often depressed and under stress. Will not cause a dependence, in contrast to a number of expensive medicaments. This is, in fact, a natural antidepressant, which will completely relax and deprive the feeling of tension. In addition, you will fall asleep more easily, so drink a cup before bedtime. You have probably noticed that women in China, Korea and Japan, and in the fifth decade of life have youthful looking skin. The secret of Asian women is that they drink tea from ginkgo which is rich in vitamins A, B and C. It successfully regenerates skin cells, freeing them from the presence of toxins and free radicals. We have already noted that the leaves of this plant have a fan-like shape, but that's not what makes them famous. The Chinese believe that their appearance can be identified with the human brain. Human memory can begin to weaken in any age, but it is the most vulnerable after 50 years of age. The risk is especially great if the brain does not receive a sufficient amounts of oxygen, leading to cerebral insufficiency. It is therefore used for the concentration and memory, either as a tea extract or tablets. Ginkgo tea is particularly effective in young people who have to study a lot for exams. Apart from helping the focus, it also improves the memory. It is used for relaxation, and gets rid of stress. The recommended daily dose is one to a maximum of three cups. Ginkgo tea for memory is drunk in the morning on an empty stomach, as a substitute for coffee. In addition to drinking it can be used for local (topical) application. We have prepared an interesting recipe for regenerating the root of the hair itself. It is necessary to find a cream that is neutral and water-based. In a saucepan boil a liter of tea from ginkgo and add 10 seeds of this plant and the same amounts of leaves. Let it stand for another five minutes, then strain and store the pot in the refrigerator. Grind the seeds in a blender until you get a fine paste. In it, add a little potion that you cooked if you want a thinner mixture. In the end, you need to get about 60 ml. Then add 40 milliliters of cream that is neutral and all mix well. Pour it into a suitable container and keep in a dark and cool place. Twice a day, apply the cream on your head and rub your scalp. Leave it to stand for twenty minutes, after which it is enough to rinse with the ordinary shampoo. After a week discontinue this treatment, but after three days continue again until you spend it. After two months, you will notice the effect. The new hairs will grow, and the current one will be stronger, you will have more solid root. When it comes to ginkgo side effects they are possible only in cases when it is taken over the recommended doses. In this case, the most frequently occurring side effects are stomach pains, headaches and dizziness. Sometimes it comes to constipation, increased heart rate or transient skin rash. Ginkgo tea is not recommended for people suffering from disorders of coagulation (clotting) of blood. Hemophiliacs should avoid it as well as people who take drugs for subsequent thrombus formation. In both cases there may be a bleeding, so consult with your doctor before you drink this potion. Caution is required in those who drink therapy against diabetes and epilepsy. Gingko tea can boost their effects. In addition, do not consume if you are taking pills that contain salicylic acid, which also includes aspirin. We have already said that this is a natural aphrodisiac, but it is not good to combine it with the medication that strengthen erections. If you want to drink ginkgo tea, dosage is very important. On average, it is allowed to take one to two cups of beverage a day. Finally, it is necessary to know that ginkgo during pregnancy is not recommended. This is true for tea, pills and other products at its base. Where to obtain preparations of ginkgo and what is the price? If you are interested in the phenomenal ginkgo tea, the price on the market can vary widely. It is around 5 dollars per pack (200 grams) and higher. It depends largely on the producers themselves. We recommend medicines from pharmacies or from better-stocked health food store. It is available as dried leaves, it is possible to obtain it in tea bags, as well as extract of ginkgo. We recommend the first variant because it is the safest. The same rules apply if you plan to shop online. Inform yourself about the product before buying it. This drink is very useful for all those who want to lead a healthy lifestyle. Therefore, the tea from ginkgo is best replacement for coffee. Each morning, start the day with it and enjoy its impeccable taste. It helps and contributes to a better memory and concentration, which will certainly have a positive impact on the effectiveness of the work. If you are looking for the best food for the brain and memory, we recommend you our article.